Some of my writer friends spend their days in cozy yoga pants. Some of them sport jeans and flannel button downs on a regular basis. Some of them would say the Oscar red carpet fashionstravaganza is the definition of prime writing time. I won't be offended if any of these friends skip this post. Writers get a bad rap when it comes to fashion. Just because some of us can skate by without leaving the house, washing our hair or showering on a weekly basis, that doesn't mean we do. This writer, in particular, loves Oscar fashion night. Here are my thoughts in no particular order about some of last night's more memorable moments. Quvenzhane Wallis, the youngest actress to ever be nominated for an Academy Award, and her puppy purses is already setting trends among nine year old girls. After seeing a quick interview with her I predict her trendsetting capabilities will soon extend to kids begging for liberal bedtimes just like Quvenzhane! I know my daughter can't be the only one who was jealous that particular detail. Amanda Seyfriend, in her Alexander McQueen dress, was the poster child for the adage about suffering and beauty. "I feel like my internal organs are going to pop out," she said, but then quickly amended her statement to profess a love for corsetted costumes which felt a little like insisting four inch heels are good walking shoes. Jennifer Lawrence in Dior Haute Couture was natural, stunning and still managed to find time to talk about food. If she wasn't already, now she is definitely my favorite actress in Hollywood. Nicole Kidman reminded me that no matter how much I hate what the march of time might do to my face, plastic surgery is not always the best option. Jennfer Garner was glamorous, beautiful and pitch perfect with the press. Every time I see an interview with her she makes me smile. The one trend I noticed, aside from puppy purses, is many of the stars were were wearing gowns that could double as wedding dresses. I ended Oscar night inspired to repurpose my wedding gown for my next black tie event. Fortunately the impulse was short lived. What about you? Any moments of crazy fashion inspiration? Do you watch the Oscars for fashion or for the actual award ceremony? Wasn't looking at the fashions (big surprise, huh?) but thought Lawrence handled herself well when she tripped in that dress going up to receive her Oscar. Fashion was once more important to me than it now - I was a huge Bill Blass Fan during his heydey. Now I wouldn't say I am completely fashion un-conscious, but it doesn't matter as much to me. However, as I lose weight, it matters a bit more, as in, "When I order new clothes I want a _______ ." I didn't watch at all. I watched the Walking Dead. And NOBODY was best-dressed there, except possibly for Andrea when she was naked. Because after the zombie apocalypse, your birthday suit is the only thing you can still get clean. Watched the red carpet during my eleven mile bike ride at the gym... At least i got through it with a bit of fun. I enjoy the red carpet because fashion had been a part of my life for fifteen years when I modeled. Alex, I know! I love her. Connie, was the blank for your new svelte size? Ilima, glad I'm not alone. Dianne, birthday suits are handy that way. Michael, that's a long bike ride!! I don't watch Tv but saw a snippet of the pre-Oscar show when I was at the gym. Jamie Fox's daughter is stunningly beautiful. Did you see her, Johanna? Her dress was gorgeous too. I could live my whole life in t-shirts and jeans and I'm probably the last one to know anything about fashion. But I did like Jennifer's dress last night. I spend time on the internet researching "not dressing sensibly." Then it's time to eat and I close the site and leave. The Oscars is where all the glamorous people come out of the woodwork to strut their stuff. I love seeing the handsome men too. Jennifer Lawrence was just awesome in every way. Love her. Beautiful, funny, real. So refreshing! I thought that too about everything seeming white and wedding-ish. I liked the one dress that lady with Jamie Foxx had on. She was gorgeous. I love the inspiration the Oscars give me. I watch them every year and every time I'm motivated to create and be brilliant. Jennifer Lawrence seemed very real. 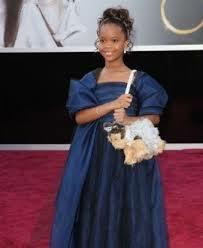 And Quvenzhane Wallis awed me with her poise - more than some adults - and she's what? Nine? Amazing! I don't usually watch the Oscars, I just check out all the dresses later! I do love to see all the amazing dresses (and maybe daydream a little about being able to wear something like that.) I also love Jennifer Lawrence, by the way! She's just so darn cute! I actually haven't watched it. I know it's terrible of me, but I just haven't had the time. But I do love Jennifer Lawrence's dress. The Oscars are to me, like the Superbowl to my husband: epic! I never miss watching. Back to the fashion: I agree with you about Jennifer Garner, she always looks great! And oh my gosh Nicole Kidman could haunt a house, she is that scary. And you know I have mad love for Hugh Jackman, but his wife Deborah, wore freaking PANTS to the Oscars- It's the dang OSCARS woman, put a dress on! If you don't want to show leg, wear a long one. I didn't watch the Oscars (or the BAFTAs) this year, although I do like the glitz of those celebrations. I've been to the BAFTAs once (worked on it and got invite) and was amazed at how long the ceremony goes on for... everyone was ravenous afterwards! I don't get to watch as many movies as I like (I only saw three in 2012), so I wasn't familiar with most of the movies that were nominated this year. So I didn't watch the Oscars, but I did look at the pictures of the dresses people wore. Charlize Theron's dress was my favorite. I liked Jennifer Lawrence's dress too. Yes, everyone is talking about how she tripped, but I think that made her seem more human; also, I'm sure the fact that she won an Oscar made her feel better. I didn't watch the Oscars, but I enjoyed your red carpet fashion commentary. Perhaps your daughter could help you repurpose your wedding dress into a stylish gown? I love that idea, but I'm into upcycling stuff. I once turned a cheesy 80's blazer into a cute modern jacket. Fun times. Funny. As much as I am a dedicated naked girl, I still have enough of me that wants to be a fairy princess that I love the super fancy dresses. And Jennifer Lawrence is a favorite of mine, too. I got sucked into about an hour of YouTube videos of her just being a goofball--she just says what comes to mind--a very naked thing to do, you know... My trend observation is that men in skinny legged pants look silly unless the whole tux is meant to be punk shiek. Lily Collins had a great dress. Aw, I wish I could have watched it all and seen all the beautiful dresses! But since we're ahead of you guys, it only began at around midnight our time. A little late for me!